Scan Time: 3 – 5 min. Scan Time: 1-2 min. Short scan time due to its ability to process more data. Brand B. M. Tech Worldwide Co. Ltd.
Our Manufacturing partners is B.M. Tech Worldwide Co. Ltd. Korea for Dexa Bone Densitometer. B. M. Tech provides GE Healthcare with ODM/OEM product by technical alliance. B.M. Tech is manufacturing GE ARIA model from last many years. 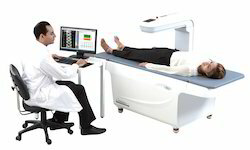 Osteo Pro Max, the central DEXA bone densitometry can be installed regardless of the location due to its Compact design. Also, it provides fast scan, and it is designed to combine the high flexibility of use with good Quality standards. The scalable architecture and portable design make OsteoPro Max provide the perfect Solution for both your working environment and time saving needs. Our Product is Certify by EN ISO 9001, EN ISO 13485, GMP, KFDA, CFDA, CE, DNV etc.